Trudi offers a discount of 25% on their first / introductory lesson! Trudi is a fully qualified musician whom has had 24 years experience of teaching the Flute, in schools and in homes across the country and with the British forces in Germany. She has a 100% ABRSM examination pass rate at distinction. Trudi started playing the flute when she was 8 years old, and later started playing the Piano. She attended Lawnside School in Great Malvern and studied at the Birmingham school of music under Bernard Herman (BBC northern dance band/CONDUCTOR OF THE GOOD OLD DAYS)) and achieved grade 8 by 15 years old and advanced certificate/DipAbrsm shortly afterwards. Trudi played with the Worcestershire \\\\\\\\county youth orchestra, the Birmingham Youth Chamber orchestra and the Birmingham Youth Symphony orchestra. Won the Cheltenham Music Festival Woodwind section and other Music Festivals and then went on to teach in Schools and perform in the Uk and BritishForces schools in Germany. More recently appearing on BBc Warwickshire and Coventry Radio, Coventry Telegraph, and performing in alliance with Unlock the Music in and around Rugby, Coventry and surrounding areas. 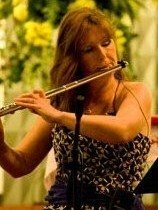 Trudi is a fully qualified musician whom has had 24 years experience of teaching the Flute, in schools and in homes across the country and with the British forces in Germany. She has a 100% ABRSM examination pass rate at distinction. Trudi also teaches the Piano/Keyboard to beginners up to ABRSM Grade 5 standard. Half hourly lessons, 3/4 hour (or one hour depending on age and standard) at competitive rates. Time allowed for Aural and theory in each lesson. ABRSM grades are worked towards although these are entirely optional. Tuition in Flute from beginners to DIPLOMA. Learn for fun or for ABRSM exams. All ages taken whether you are returning to playing after a break or you are just starting out you will find the lessons fun and relaxed.